ensures you always have the exact power you need, without having to over-pay for a setup that gives you too much. Each slice you add comes with 20 GB of RAID storage, 200 GB of premium bandwidth, and 1 GB of dedicated RAM. Need more than 8 slices? Contact us today! Select your plan by moving slider from 1 Slice to 8 Slices plans. using the latest technology to stay ahead of the competition. We use KVM virtualization for the best VPS hosting experience possible. Combine that with Dell servers, Xeon processors, SSD RAID drives for speed that can’t be beat. Our VPS server experts are there for you 24 hours a day. If you choose a VPS with server management we’ll do any server maintenance you need, or install any server software. Just let us know. Your VPS comes with a 30-day money back guarantee, a 99.9% network uptime guarantee, a 6 hour support response guarantee (most tickets are answered within 15 minutes), and a price freeze guarantee. Every VPS comes with free full backup and restore, online snapshot and high availability. Our datacenter has multiple Gigabit connections to the largest bandwidth providers in the world including tiscali, Global Crossing and Level3. Easy to use VPS control panel with full root access, and the ability to run any versions of server software you need. If you need support for old software, or you want to be bleeding edge, the choice is yours. We have a wide variety of ISOs ready for you to select when you order. If you have your own ISO you’d like to use to get your VPS up and running, we’re happy to upload it to your server for you. 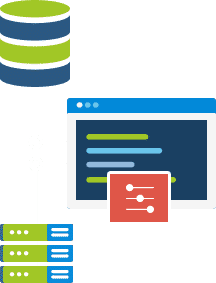 If you choose cPanel or Plesk for your control panel, you can add management to your server and our team will help with any managed VPS hosting issues you might have. Adding new software, upgrades, or configuration changes. We can add your server to our in-house Nagios monitoring system that checks the services running on your server to make sure everything is up and running. We will also proactively react to outages. If your data is valuable, you can make use of our continuous data protection system. Backup your files as often as you like, keep as many restore points as you need, and easily restore as little as one file. We highly recommend adding Softaculous. With 1 click you can install over 400 of the most popular scripts online. Softaculous can even keep the scripts up to date automatically for you when updates are released. All-in-one security with robust herd protection against the newest attacks, powered by AI. Imunify360 includes advanced firewall, IDS/IPS, malware detection and removal, reputation management and patch management with KernelCare. Imunify360 will actively monitor your server and all files that are uploaded or modified against a database of known exploits and automatically quarantines them, preventing hacks before they happen. Fully redundant FTP backup available for keeping full hosting accounts backups. Quickly retrieve and restore full account backup from your server with ease and save your VPS disk space.